After an earlier than expected mid-update which coincided with Triton’s 40-year anniversary, the 2020 Mitsubishi Triton shouldn’t bring notable upgrades except if the brand launches a more rugged version of the model to challenge a high-performance rival such as the Ranger Raptor. The Triton is the brand’s second fastest-selling model and available in more than 150 markets around the globe. However, the heavily revamped Triton version will reach some markets in late 2019 and could arrive as the 2020 model, the official debut was at the 2018 Bangkok Auto Show. Mitsubishi made extensive styling makeover and equipped the model with the latest safety systems. The list of upgrades included also revised running gear but the model continues with the same engine options. The Thai-build truck competes with increasingly more sophisticated, mid-size models like the Toyota Hilux, Ford Ranger, Nissan Navara and thanks to the recent update should position itself as the top pick in the class and continue without significant changes until the next redesign. Mitsubishi made significant styling makeover of the popular, mid-size Triton for the 2019 model year. The criticized “sporty design” was replaced with more aggressive “Dynamic Shield” front-end style which defines brand’s modern SUVs the Shogun Sport and ASX. The model has slimmer headlights positioned much higher and 100 mm taller hood. It looks also tougher from every point of view thanks to the re-sculpted body panels. The front section includes deep fog light slots and squarer fender flares redefine the profile style compared to the pre-refresh version. The 2020 Mitsubishi Triton comes also with the LED taillights and will offer various wheel options including two-tone design and sizes ranging from 16 to 18 inches. The new model year will also bring additional body color options and the possible performance version would have a more rugged appearance with unique trim accents, off-road components, etc. The cabin of the Triton was updated for the recent refresh but not as extensively as the exterior. Mitsubishi added more soft-touch points and introduced roof-hinged air vents for the rear-row passengers. The model benefits also form the updated infotainment platform. The base Triton will include a 6.1-inch touchscreen, air conditioning, fabric seats and vinyl floors, rearview camera and sensors, etc. The upper grades will add a larger 7-inch display, Apple Car Play and Android Auto, digital radio, side steps, etc. Upgrades will also include nicer upholstery, dual-zone climate control, rear-mounted air vents, additional speakers, leather treated steering wheel, Sports bar, and more. There will also be active safety systems like lane change assist, front and rear collision mitigation, blind spot monitoring, auto high beam, and rear cross traffic alert. The top-tier version will lift the stake with the leather upholstery, heated seats, surround-view camera system, etc. 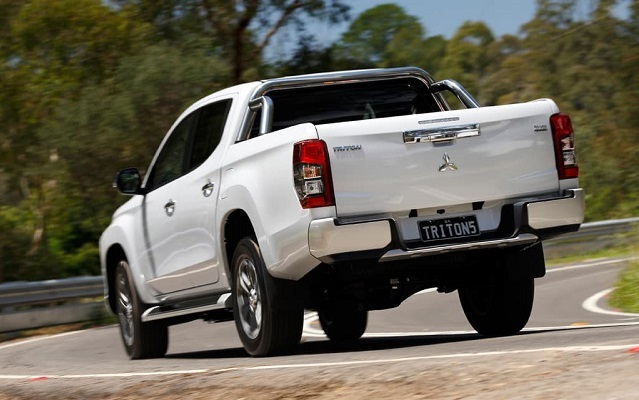 The 2020 Mitsubishi Triton won’t again change the propulsion system which was also the case for the recent mid-update. The new turbodiesel engine arrived with the current generation introduction and will again power most versions of the model. The single cab chassis models will get a 2.4-liter 126 hp petrol engine and manual gearbox. A proven and efficient 2.4-liter variable turbocharger geometry diesel engine will continue to provide strong low-end torque punch. The max power output is 179 hp at 3500 rpm and peak torque of 430 Nm is achievable from 2500 rpm. This engine will again be in the combination with the 6-speed manual transmission or 6-speed automatic which received additional gear and revised design for the recent update. The 2020 Triton will also provide well-weighted steering and continue to benefit from the upgraded braking system and revised rear suspension setup. The 4WD Super Select II system will allow the on-flay switch between the rear-wheel drive and all-wheel drive via the rotary dial. The model will also manage the running gear according to the road conditions though available driving modes for Gravel, Mud, Snow, Sand and Rock. A rear differential lock and hill descent control will also unleash go-anywhere ability. 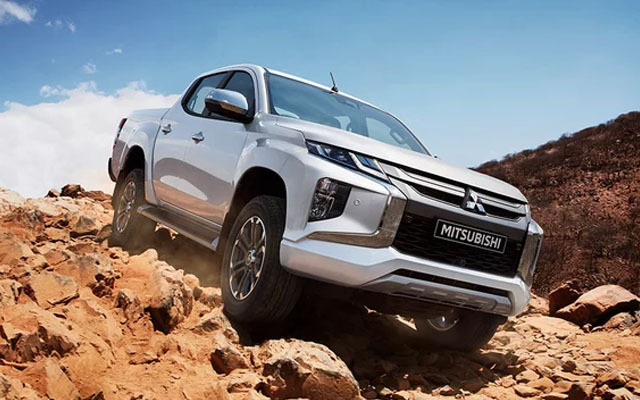 The 2020 Mitsubishi Triton will again be available in 20-version range with different cab styles and levels of refinement. The model should go on sale in 2020. The most basic model with the petrol engine should cost from about $22, 500. The diesel-powered version should start closer to $30, 000.